Battling depression, anxiety and chronic illness, Hannah didn’t reach out for help until she was in her darkest place. Realizing the big impact of little things like a simple text from a close friend or focusing on a craft, this bold, brave soul has found the right tools for her own healing. With a combination of faith, kindness, and a realization that we aren’t actually alone in our suffering, read Hannah’s full story below. I have battled a difficult and strenuous battle with depression. Anxiety now depletes me most days because of a chronic illness, but depression has been a constant since age 12. Nine years of my life. I think I always knew I had a disposition to be more of the depressed type. I am just more of a melancholy, pessimistic, glass-half-empty person. Just as I was more of a stressed out, anxious person. But, I think I realized I struggled with depression when I was 16 or 17. I knew I was sad frequently when I was younger, but I didn’t have a term to accurately describe it. Besides being an overly emotional pre-pubescent preteen. It got bad when I was 16 or 17. I was suicidal. I contemplated in great detail killing myself. I would “punish” myself by writing horrible things about myself all over my body, beating my body on objects (mostly my head), and trying to pass out by holding my breath. I never cut so I think I brushed off my depression because it didn’t come out in that specific way like many people my age. I was depressed in the most high functioning way, it didn’t deter me from taking care of myself or cause me to be unmotivated. It just wrecked my mind. It was paired with self-hatred and was a dangerous cocktail of mental distress. It affected me then in how I allowed myself to be treated. In how I treated myself. I felt worthless and disregarded myself as trash, I collected abusive boyfriends like it was a hobby as a means to punish myself for merely existing. I did this for years. I didn’t ask for help for years. Actually, until this year. I figured living in a state of mental illness, self-hatred, depression and contemplating suicide was going to be my normal and I would live life that way. It wasn’t until it got bad this year to where I couldn’t function. To where I didn’t want to function. To the point where I wasn’t eating or showering or doing anything besides getting up twice out of bed once to use the bathroom and grab a snack just in case and the other time to turn on the TV. It was the first time I was entirely knocked flat on my face by depression. It was coupled with guilt and self-hatred and this suffocating feeling of worthlessness. Like my existence was a burden. I sought help because I had this moment where I knew “I could have something else. 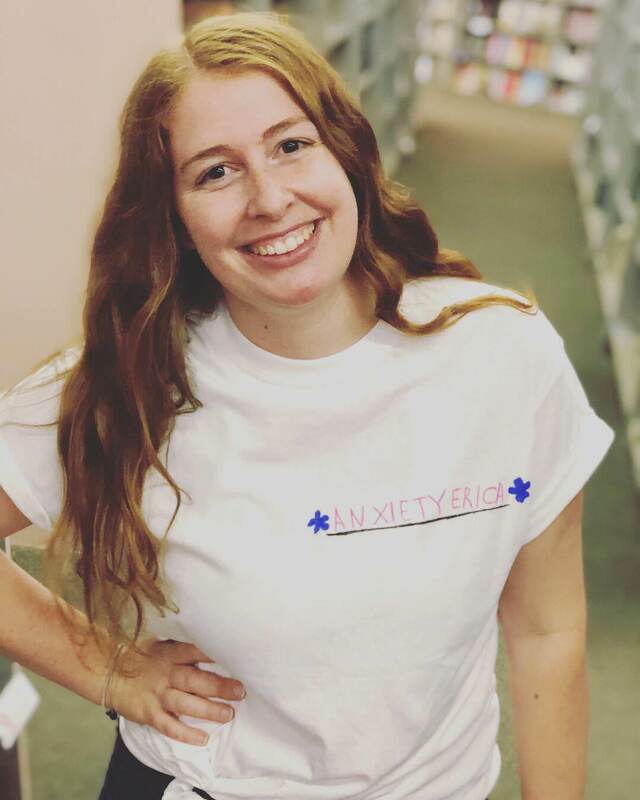 I could have something better.” But I also sought help because I became a part of the body positivity community, where I saw strong women who would talk about their mental illness along with eating disorders and body dysmorphia and a million other things. It gave me hope. Like maybe I could talk about it and try to move forward, too. Depression is still something I battle. I think I will always battle it, but the difference is it won’t win. It’s not that I am happy constantly. In fact, most days I am anxious and overwhelmed, but what I gained was this ability. This ability to sense when an episode was coming on. Just before I lost my ability to feel human and function and go about life, I could sense it. And I have learned to take that brief moment to remove myself from the situation and seek peace from what could happen. I learned that going outside and forcing myself to be around my best friends sometimes saved my mind. That sometimes sending a text with a small phrase “I am falling apart, help” to a close trusted friend could ease my mind. Sometimes it was calling my mom and vocalizing my struggle. Sometimes it was doing a craft, something to put my mind at ease and focus on. But mostly, it’s been my religious beliefs that I’ve turned to in times where I feel as though I am on the brink of falling apart. Mental illness has taught me to be compassionate. To be selfless. Which seems odd, but my own depression and mental illness struggles have taught me that there is more than just me who has to coexist with depression, OCD, PTSD, anxiety, on and on. I am not the only one. This is both a comfort that in times where I feel most alone, there are thousands of people feeling the same exact way. But it is also a reality check to step outside of myself. To know that on the days where I am close to an episode and forcing myself out of the house or my mind, those are the days where a stranger smiling at me with my disheveled appearance or the kind words of a friend are life changing. It taught me how to be kind. How to smile at strangers and speak lovingly to my friends at all times. Because that’s the thing about mental illness: most often it’s not apparent. The longer I am alive, the more I have discovered how so many people I know walk through everyday with depression, but also a smile on their face. And it has taught me that just because someone seems put together or happy or whatever doesn’t mean that it’s true or that they don’t need kindness just as I do. This feeling that you feel so deep, it’s depression. It’s not your enemy. It’s not what defines you. You are not broken because of mental illness. You are not changed because of it either. It exists. As do you. And learning to understand this, that your depression doesn’t equal brokenness and that falling apart is fine will be something that could very well save you.